We keep a supply of undecorated yellow, chocolate and marble cakes on hand for last-minute orders, but to assure you get the size and flavor cake you'd like, please call or come in to place your order at least three days in advance. We carry white rolls in our store on saturdays - and the day before most holidays. For rolls on other days, or for other types of rolls, please order at least one day ahead. The best bakery with the best service!! I really enjoy watching this place where they bake everything fresh and you can order different things for your reunions, parties or just for a nice treat. Quaint and homely. They always have a cheerful word for you. Freshly baked bread. Heavenly aromas drifting everywhere. You want to buy it all. Be careful though. They only accept cash or cheques. No credit. I love their date bars and buy a 1/2 dozen and freeze them till I am able to get over and get 6 more. The breads, cookies, protein bars, have not had anything that we did not like. Best little bakery in town! Fruitcake that even a fruitcake hater enjoyed!! 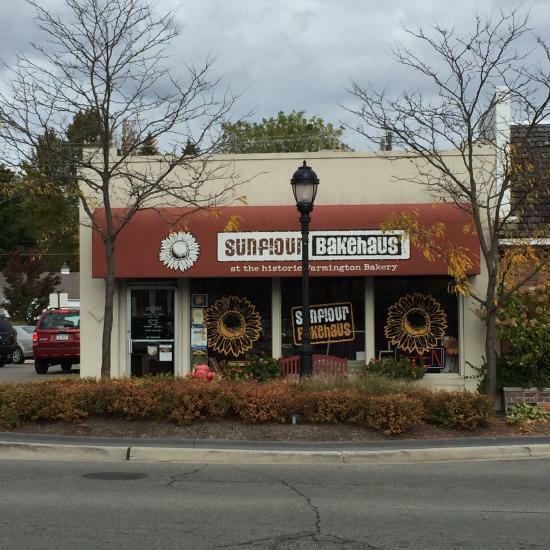 Get quick answers from Sunflour Bakehaus staff and past visitors. Pets aren’t allowed inside but they provide a water bowl outside for the many dogs who walk to the bakery with their owners.